Whenever you need a temporary (or longer) office setup, some will think of mobile trailers as the solution. They’re cheap and easy, right? Cheap and made that way. 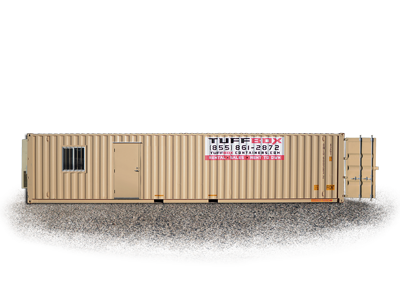 Tuff Box office containers are just as affordable and twice as strong. 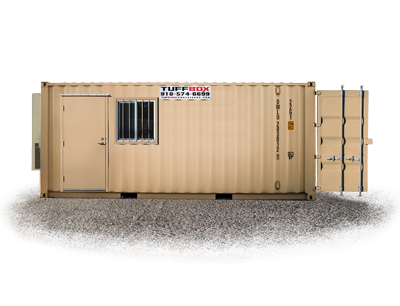 We’ve got the toughest mobile offices you could ask for with our mobile shipping container offices. They are made of steel with fully welded doors and windows and are an unmatched solution for mobile offices. 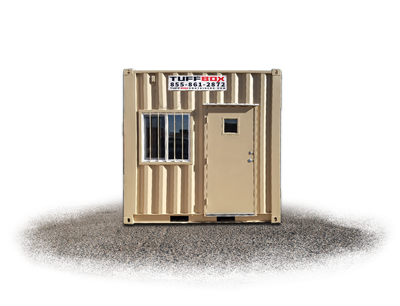 We offer reinforced entry points with our steel security doors and rebar covered windows on all of our shipping container offices. Most come with a commercial HVAC unit to keep you warm or cool throughout the seasons, multiple electrical outlets, LED lighting for energy efficiency and they are forklift ready & easy to move, if you need to reposition your durable shipping container office. The interior has sturdy, insulated, humidity-resistant walls (not drywall) with commercial grade flooring. The 10-foot shipping container offices will come completely insulated, with reinforced windows, heat and air conditioning, LED lighting and multiple electrical outlets. The 20-foot shipping container offices also come loaded with a commercial HVAC system, LED lighting, insulation, multiple electrical outlets, and a steel security door. However, this unit also has reinforced windows and we have some offices with double locking swing doors. 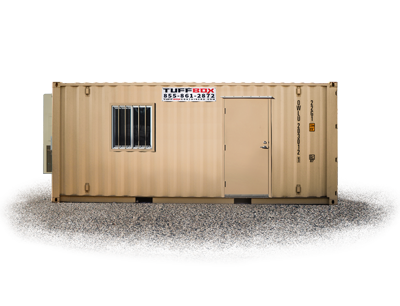 The 20-foot combination container includes our standard Tuff Box office features such as the reinforced windows, commercial HVAC system for climate control, multiple electrical outlets, and steel doors, but it is also combined with a storage container on the other end. 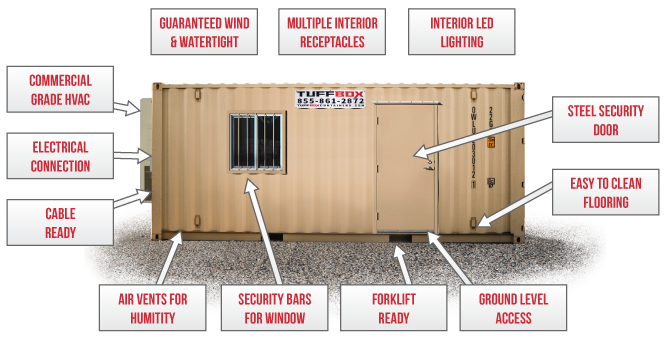 Most of our 40-foot shipping container offices come with 5 reinforced windows and 2 fully welded steel security doors, insulation, multiple electrical outlets, commercial grade HVAC, and LED lighting. The best of both worlds! 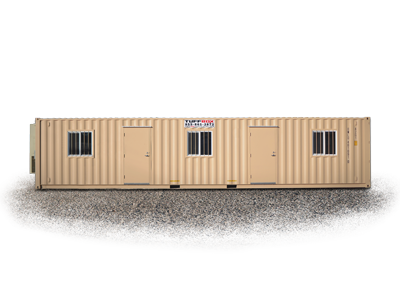 Our 40-foot combination office and storage containers are split into both an office and attached storage that is still separate of the office workspace area. The office portion as well as the storage are separated into two sections, with the storage area including a set of double locking swing doors. 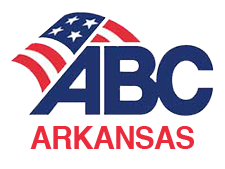 With the physical damage waiver, you protect yourself from damage that may occur in a parking lot, job site, or ranch/farm. Our delivery process is pretty straightforward: We use a tilt bed trailer to load and unload your container office. We verify with you the date that is convenient for you, and then we load the container onto our truck with a tilt bed trailer. The truck will arrive at a predetermined date and time and unload your container office by backing up to the designated delivery site, slowly lifting the ramp, and slowly sliding the shipping container office onto the ground or pad site. Of course, we need to make sure you give us enough space in order to do this, and we also require that the delivery site is clear of any major obstructions, snow, or ice. For more details on our frequently asked questions about delivery, please refer to our FAQs page.